The last Welly-moot of 2013 will be held on the last Sunday of 2013, December the 29th. Unlike most moots, this meeting will NOT be held at the Embassy. Like list year, Alex and I (Jack) are hosting the meeting at our home. As such we're not taking in new members for this moot, but it might be nice to catch up with regulars in our lounge for a shared lunch. We're aiming for a "bring a plate" lunch, so please bring something to share. Last year we had mostly desserts, (which wasn't a big problem), but mains would be most appreciated as well! The theme, if there is one at all, will be the obvious one: "what did you think of the second installment in Peter Jackson's Hobbit trilogy". Please email me with your intentions! Peter Kenny visited us today from Brisbane, Australia. 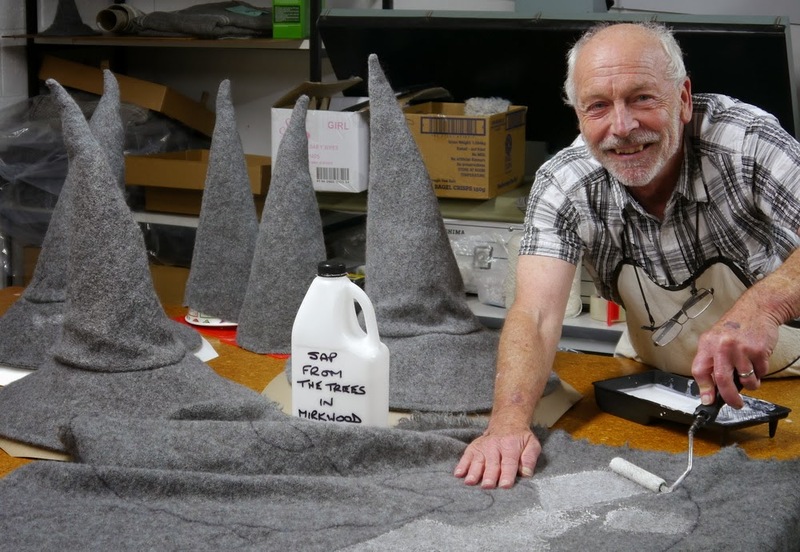 He was in Wellington for a few Hobbit 2:DOS events, and I had arranged to take him to Stansborough Fabrics, the people who created the fabric for Gandalf's cloak, as well as the Elven cloaks used in LOTR. To get us there, I managed to convince Wellington Rover Tours to lend a hand, and they provided me with a van for the afternoon. Peter Kenny will be coming on one of the LOTR tours over the weekend as well. In fact, Stansborough created far more than just a bit of fabric for LOTR. Think: over one kilometer of fabric for LOTR; enormous amounts for The Hobbit movies, more for Avatar, Narnia, The Waterhorse, Thirty Days of Night, and a whole lot of other movies. A few scarves with different colours weaving patterns. We arrived as a small group - it was just me (Jack), Peter Kenny, Franziska, and Adam, and Kris joined us as well. 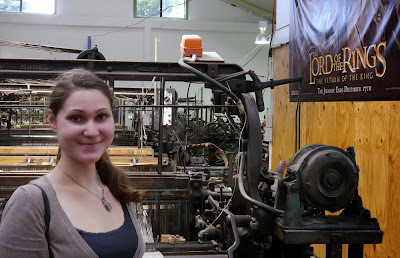 When we got to the factory, Cheryl Eldridge met us at the door, and took us into the small shop area. Through the window we could see the enormous looms already. 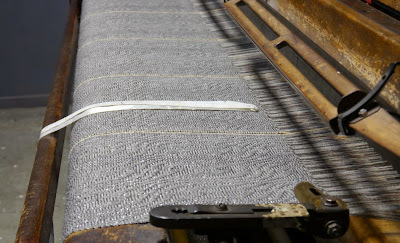 Cheryl described how the factory came to be, from breeding these odd looking grey sheep, to finding the old looms, to searching for people who had the almost lost knowledge to use them (and fix them when they break)! This loom is set up with the LOTR Hobbit pattern, ready to go. Barry took over the tour, and showed us what he was working on. All items are created by hand, and apart from some mechanical tools, no modern machinery is involved in the process at any stage. It's nice to know that when you see the final product on screen, I think. The looms are over 100 years old at the stage. Barry making hats for a certain wizard. Note what SECRET ingredient he's using! 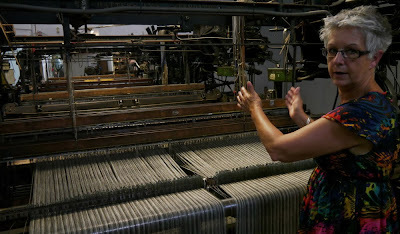 After seeing how the hats were made, it was Richard's turn - to show us the looms in operation. Incredibly noisy, I tried to film a bit of it but got too close, and Richard shut them off, as apparently (and only occasionally) the little shuttle can shoot off and kill the closest camera person. I'm not sure if he was kidding but took him at his word! 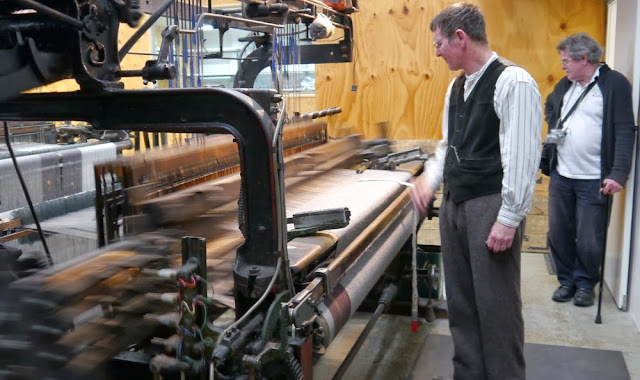 Richard looks calm, while the loom has become a blur of action. Peter looks on and seems impressed! All in all, a great afternoon - I think everyone enjoyed seeing the factory in action! Franziska looks like she had a good time. Stansborough has an online shop as well, where a lot of products are offered for sale. Check them out, they ship to most countries. Had a great time at the second Hobbit movie (again) last night, at the Embassy Theatre Midnight Screening. While there, we met up with the lovely people from Stansborough Fabrics, who not only created the cloaks for Gandalf in the Hobbit movie, but were actually wearing them at the cinema last night as well. Friday the 13th of December, I will take a mini-van with Peter Kenny, and 10 empty seats from Wellington City to the other side of the Wellington Harbour, to the Stansborough factory in Petone, where they will take us for a guided tour around the 100+ year old looms. If you would like to see this, email me as soon as possible at jack@welly-moot.com and I will tell you where to be at 2:00pm on Friday afternoon. The first 10 people get in, so be quick. First come, first served. This is a free event, but there are STRICTLY limited spaces available, so please, do be quick! Stansborough created fabrics and clothing for LOTR, Hobbit, Avatar, Narnia, and a host of other Wellywood productions, so this is an exciting opportunity to see where it all happened! We'd also like to thank Wellington Rover Tours for helping out with transport for this event as well. Rover Tours have been running LOTR tours in the Wellington region for longer than anyone else - so if you're after a great tour, please do check out their website as well. All their guides are crazy about the LOTR movies, so you can't go wrong. So, email me asap, on jack@welly-moot.com !